Use the menu along the top of each page to navigate your way around this site. The Who's Who of Victorian Cinema main title takes you back to the home page. The main Who's Who section has nearly 300 biographical entries, searchable either through their alphabetical ordering on the Who's Who page, or by using the Find option (this searches across the whole site - keep searches to one or two words only, as this will produce better results). Note that it is necessary to put in the correct accents when searching (so, searching under 'Lumiere' will yield no results, searching under 'Lumière' will yield over 140 results). For a list of key strokes for accented characters, see the list at the bottom of this page. Each entry gives the subject's birth and death dates (where known), a photograph (where available), full name, one-line description, biography and the contributor's name. Entries feature hyperlinks (in blue) to other names and key technologies. Given the prevalence of the Edison and Lumière names, these are cross-linked sparingly. Japanese names are written surname first. The left-hand table lists articles or books used in compiling the entry or providing further information (Article References). Full bibliographic references are given, except for the most common ones - these are given short citations and hyperlinked to the full citation/description in the Sources section. Further References lists other bibiliographic sources, generally works published since 1996. 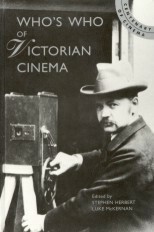 The Bibliography section provides an annotated select listing of book publications on Victorian cinema, primarily those referred to most commonly in producing this Who's Who. The books are listed by author, with full publication details and a brief critical summary. Works on individual filmmakers or companies are not included except where the work also gives a broad picture of the period. To assist researchers in approaching Victorian cinema by theme, all of the names have been classified under Groups. This section classifies entries by type - these categories include Actors, 'The Brighton School', Doctors, Engineers, Fairground showmen, Magicians, Monarchs, Sportsmen, War reporters, and Women. There is also a Countries index classifying entries by nationality and the countries where they filmed. The Machines section illustrates the main motion pictures devices referred to in the text (hyperlinked). Each machine is listed by name, with its creator and date, together with a short description and an illustration. Clicking on the illustration produces a higher resolution image. An extensive Resources section exists to encourage researchers to study further in the field. Users should use the section menu on the left-hand side to find information on websites about Victorian cinema, film archives, books, journals, organisations, videos and news and events. There is a chronology of Victorian cinema and the Victorian era 1871-1901, and a section for texts, reproducing original articles as well as current writing. The Features section has illustrated background pieces on aspects of Victorian cinema, including a Technical essay giving the background to Victorian motion picture technology, covering such issues as camera and projection, flicker, celluloid manufacture, film sizes, colour and stereoscopy.